Made from mar-proof rubber coated steel, Security Latch is designed to eliminate chain locking exits. Four different types are available: double door latch for doors with a center post, a single right door latch, a single left latch and a double door latch for doors without a center post. When you are looking to prevent break ins and burglaries, Security Latch is the best solution for reinforcing your door ways. It allows occupants inside and outside the building without using chains and padlocks. The door latches are versatile and can be used in your school, facility, factory, office, store or any other building with a panic door. All Security Latch models are available with a cable lock. This system does not interfere with the function of Security Latch. A special key is provided with each unit for easy removal to storage area. All cable locks should be factory assembled. 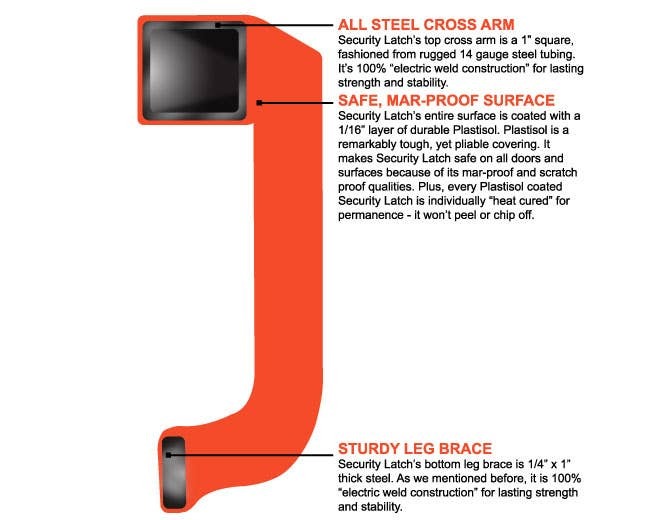 Security Latch has many benefits over standard methods of panic door retaining devices. Simplicity of application, easy removal and storage saves employee time securing a building. The average school or building can be equipped with Security Latch for less than insurance deductible incurred as the result of a break-in.